The female clash between Shiriri and Awarewaunau Snipers Football Clubs. competing (23 females; 24 males) continued over the weekend with a number of matches. 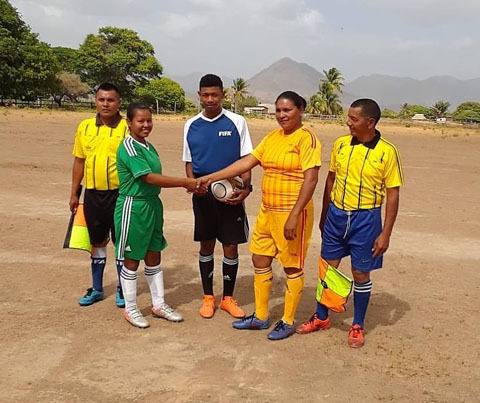 At Shulinab in the South Central/Deep South Zone, Awarewaunau Snipers edged Shiriri 2-1, thanks to goals from Trisha Alfred in the 6th minute and Diana Griffith in the 78th. Shiriri got their consolation off the boot of Sharon John in the 2nd minute. The respective Female Captains of the Awarewaunau Snipers and Shiriri Football Clubs shake hands before their match in the presence of the Match Officials. 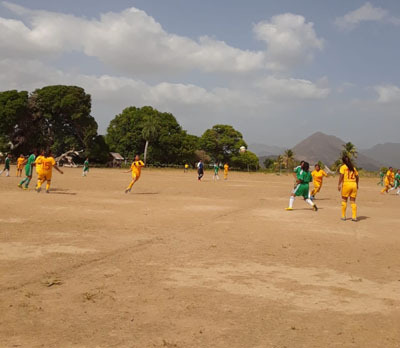 Shiriri male team then exacted revenge on Awarewaunau Snipers when they won via a similar scoreline on account of goals from Abraham Ignace in the 8th minute and Andrew Lewis in the 79th minute. Snipers got their lone goal from Gonzal Bernard in the 22nd minute.